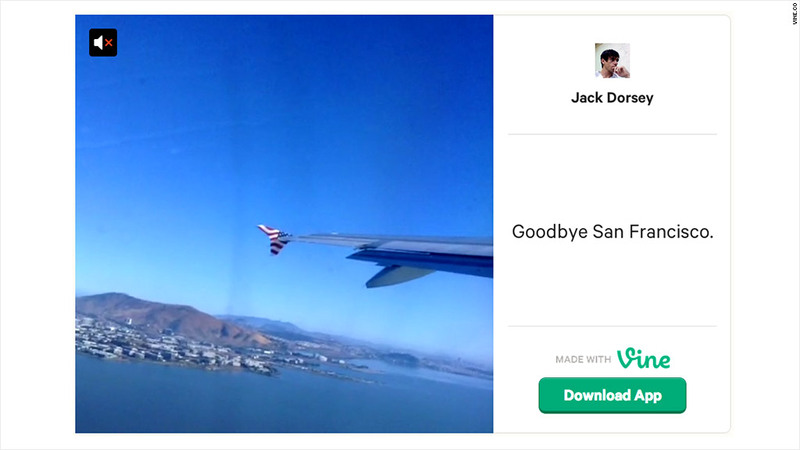 Twitter creator Jack Dorsey recently tweeted a Vine video he recorded while his plane took off from San Francisco. Twitter founder Jack Dorsey tweeted a number of Vine videos this past week documenting a drive through D.C., his walk through LaGuardia airport, and his plane taking off in San Francisco. Dorsey appears to have recorded the takeoff from his seat on the airplane -- which would be directly in conflict with what flight attendants always instruct passengers to do: power down anything with an on/off switch during takeoffs and landings. Dorsey, who now is the CEO of mobile payments company Square, did not reply to requests for comment. But a possible rule change could mean that passengers no longer need to heed the warning anyway. Currently the Federal Aviation Administration prohibits the use of most personal electronic devices on airplanes during takeoff and landings, or whenever the plane is flying lower than 10,000 feet. That goes for both commercial and private planes, although a catchall in the regulation says it's ultimately up to the operator of the airplane to decide what devices to prohibit. The agency has long claimed that using those devices during takeoff poses a safety issue and that radio signals emitted from electronic devices could interfere with an aircraft's communications. But FAA officials know that it's not only Dorsey who uses mobile devices when the plane is flying at low altitude. Sixty-nine percent of adult passengers reportedly use a portable device during flights and almost one-third of passengers say they have accidentally left their device on, according to a recent study by the Airline Passenger Experience Association and the Consumer Electronics Association. The agency created a committee last year to test what kind of devices might be OK for passengers to use on board in those situations. A draft of the committee's report, obtained by The Wall Street Journal, recommends the FAA to relax its ban on using some types of personal electronic devices. This could apply to e-readers and MP3 players -- but not cell phones, which travelers still won't be able to use to make calls at any time during flights. "The FAA recognizes consumers are intensely interested in the use of personal electronics aboard aircraft," said an FAA spokesman in a prepared statement. "That is why we tasked a government-industry group to examine the safety issues and the feasibility of changing the current restrictions." The committee, which first met in January, was given six months to make its recommendations, but the FAA said it is willing to wait another two months for the safety assessment before moving forward. Last week's news of a possible rule change is not too surprising. Julius Genachowski, who just recently stepped down as Federal Communications Commission chairman, publicly advocated for the FAA to relax its rules on electronic device use in the past while he was still at the FCC. "It shows that people have an insatiable demand to be connected these days," said Michael Small, the CEO of in-flight Wi-Fi provider GoGo (GOGO). "In even those few minutes before takeoff they want to be on their device" he said.